You can change the display range of a table view and a time chart by placing the mouse cursor on the boundary between the table and chart and dragging the mouse to the right or left. (1) is referred to as the "body part". Each rectangular area where a date column and table view row cross is called a cell in which main information is displayed. Using information displayed in each table view row, you can display various other information or perform various operations. (2) is referred to as the "top part". The top part displays time. The day of the week of the header can be set in the "Days of week format" property on the "Locale" tab of workspace settings dialog (Menu [View/Workspace Settings]). (3) is referred to as the "body part". Each rectangular area where a column and row cross is called a cell in which the values for each property are displayed. You can scroll the main area of the table display and display each property. The up/down scroll is linked to the up/down scroll of the main area of the time chart. (4) is referred to as the "top part". The top part displays properties of the table. (5) is referred to as the "left part". The left part is the leftmost columns of the table view rows, scrolling only vertically. Using the information displayed in each row, you can display various other information. (6) is referred to as the "corner part". Usually, the corner part shows the year of the dates of the time chart. (7) is referred to as the "style tab". It displayed the registered styles, which when clicked display the corresponding style. A time chart shows time on the horizontal axis, supporting various related operations and display settings. The corner part of the window displays the year of the dates shown on the horizontal axis. The top part of the window displays the time scale. 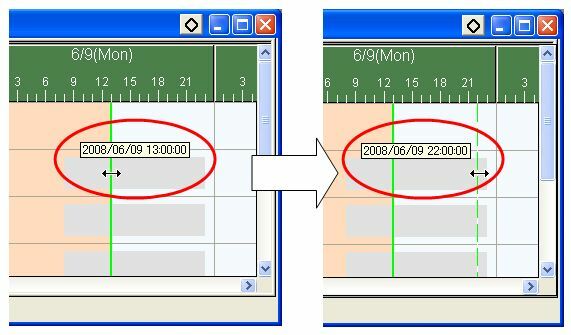 On a time chart, various day demarcation lines are displayed as shown in the figure. The time axis of the time chart is displayed in 1-day units by default. You can change the unit term to hour, week, or month. 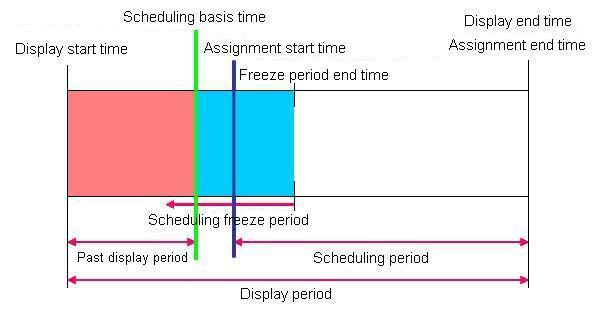 Re-display the time chart in the specified period. If week is selected as the unit term of the time axis of the time chart, you can set the start day of the week in the “Start day of the week” property. By default, "Mon" is set, and weeks are displayed with Monday as the start day of the week. If month is selected as the unit term of the time axis of the time chart, you can set the start day of the month in the “Start day of the month” property. By default, the 1st is set, and months are displayed with the 1st as the start day of the month. Date lines can only be moved if they are specified as an absolute date (eg. specified inside hash marks like #2009/01/01 00:00:00#). When the mouse is held over a date line which is specified as a relative date (eg. PROJECT.BasisTime+1d) the cursor will not change and the line cannot be moved. When moving date lines, the movement will be in steps of one hour, from the original position. If the Ctrl key is held down while moving, the movement will be in steps of one minute. If the Ctrl key is held down while moving, the movement will be in steps of one minute. Often the scheduling basis time and the scheduling period start time are the same date, so the lines are overlapping on the chart. In this case the default behavior is to select the basis time for moving with the mouse. If you want to move the scheduling period start time line instead, holding the Ctrl key when selecting the line will cause the scheduling period start time to be selected. Clicking the OK button will move the time. Clicking the Cancel button will not move the time.